According to new research by the University of Zurichâ€™s World Glacier Monitoring Service the global warming trend continues and as a result the glaciers around the world are melting for the 18th year in a row. 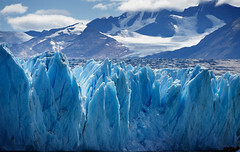 According to the authors of the study the worldâ€™s glaciers lost 2 meters (2000 mm) of thickness on average in 2006-2007. And that "the new data continues the global trend in accelerated ice loss over the past few decades." The authors also note that the rate of ice loss is twice as fast as a decade ago. "One year doesnâ€™t tell us much, itâ€™s really these long-term trends that help us to understand what's going on," Michael Zemp, a researcher at the University of Zurichâ€™s Department of Geography, said in an interview. â€œThe main thing that we can do to stop this is reduce greenhouse gases" that are blamed for global warming. Prof Wilfried Haeberli, director of the World Glacier Monitoring Service, warns that many glaciers will disappear by the middle of the century. And that this will result in devastating effects around the world such as rising sea levels and threatening the livelihoods of over two billion people. "If the climate is not really cooling dramatically, they'll retreat and disintegrate," said Haeberli. "This means many will simply be lost in the next decades - 10, 20, 30, 40 years. "If you have a realistic, mid-warming scenario, then there's no hope for the small glaciers - in the Pyrenees, in Africa, in the Andes or Rocky mountains. The large glaciers in Alaska and the Himalayas will take longer, but even those very large glaciers will change completely; they will be much, much smaller, and many of them will disintegrate, forming lakes in many cases."